I feel very lucky to have gotten to know my friends Masha and Aaron this year. Not only are they fun – they live close by and their dog Henry and Winston are best of pals. After lots of wine with Aaron and Masha – I also have a very tired dog the next day! No complaints here! 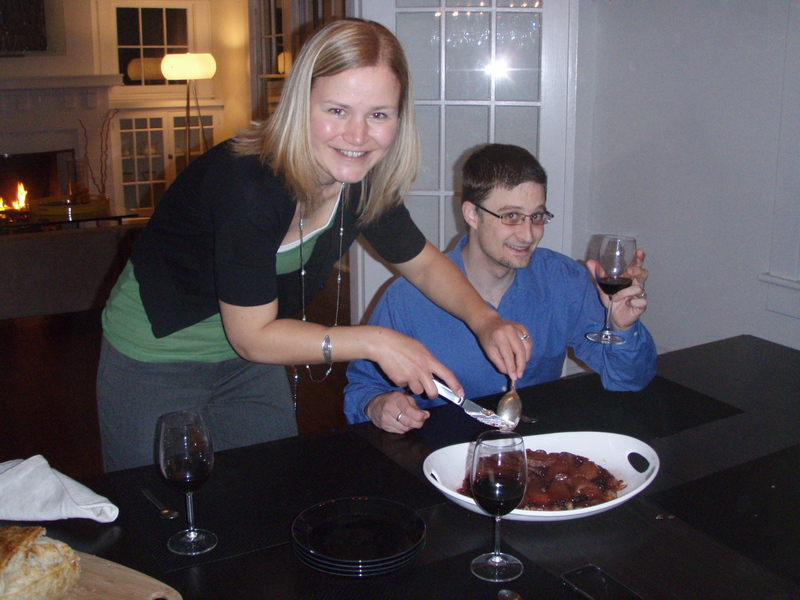 Masha brought her delicious Caramelized Upside-down Pear Pie over last Saturday for dinner. So tasty and perfect for a cold night! I highly recommend it! This can be served with whipped cream or ice cream. What you will need: 5-7 firm, ripe pears 6 oz caster (superfine) sugar 8 oz (unsweetened) shortcrust pastry 4oz or 1/2 cup butter 1. Peel, quarter and core the pears. Toss with some of the sugar. (My secret is to add a little bit of lemon zest) 2. Melt butter in heavy, ovenproof tall pan (NO PLASTIC HANDLES!) Add the remaining sugar. When it changes color to brown, arrange pears in the pan (in a flower / rays of the sun pattern). (My secret is to add a slash of rum or something like that) 3. Continue cooking, uncover, for 20 minutes, or until the fruit has completely caramelized. 4. Leave the fit to cool in the pan. Preheat the oven to 400F. Meanwhile, on a lightly flowered surface, roll out the pastry to a round that is slightly larger than the diameter of the pan. Lay the pastry on top of the pears and then carefully tuck it in around the edge. 5. Bake for 15 min, then lower the oven temperature to 350F. Bake for a further 15 min, or until the pastry is golden. 6. Let the pie cool in the pan for a few minutes. To take it out, run a knife around the pan’s edge, then, using oven gloves, invert a plate over the pan and quickly turn the two over together. The pie is best served warm.